Have you been checking off the gift list to see who you haven’t finished shopping for yet? Are there one or more special names that should be on the list but aren’t? I’m talking about the four legged family members of course. If there isn’t a check by their names yet, I’ll help you out. 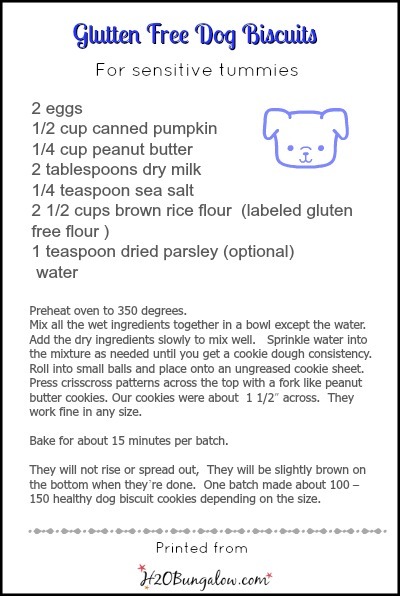 This gluten free dog biscuit recipe is easy to make, good for a pups digestion and dogs love them! Unfortunately she went to pup heaven a few weeks ago:( I was planning on making these for her this Christmas. She loved them. Because she had a delicate constitution, most treats were too hard or rough on her system. But these were OK. 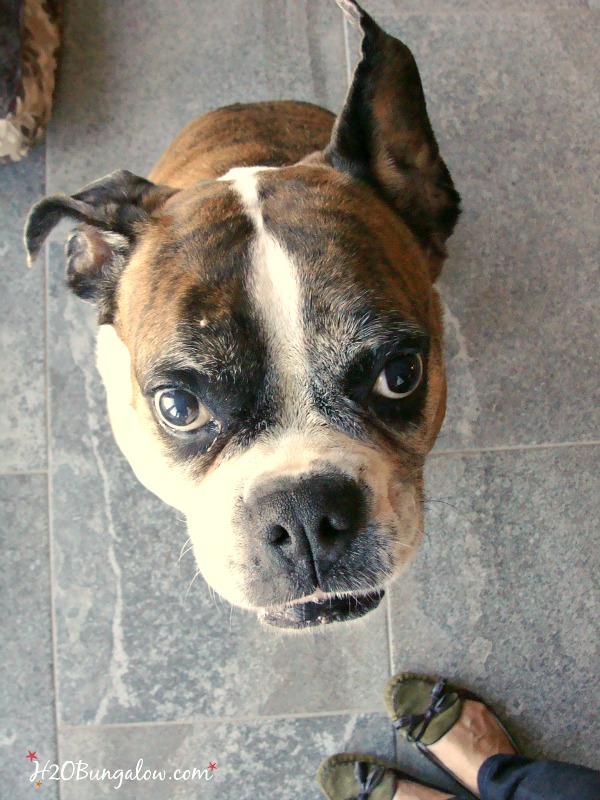 This gluten free dog biscuit recipe was the perfect consistency and size for her delicate needs. Unless you or your neighboor have a kennel, one batch makes plenty enough for a family of dogs and your neighbors dogs too. 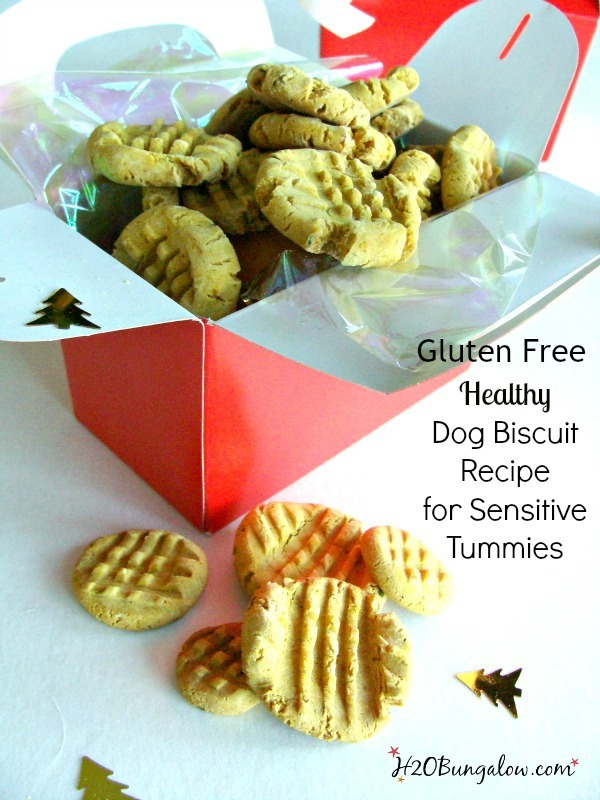 In other words, this gluten free dog biscuit recipe makes a lot of tasty dog treats! Mix all the wet ingredients together in a bowl except the water. Add the dry ingredients slowly to mix well. Sprinkle water into the mixture as needed until you get a cookie dough consistency. Roll into small balls and place onto an ungreased cookie sheet. Press crisscross patterns across the top with a fork like peanut butter cookies. Our cookies were about 1 1/2″ across. They work fine in any size. Bake for about 15 minutes per batch. They will not rise or spread out, They will be slightly brown on the bottom when they’re done. If you’d like to download the recipe and print it out just click on the thumbnail below for a pdf version you can save to your computer. 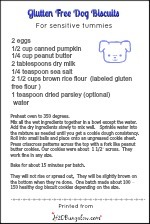 One batch makes about 100 – 150 healthy dog biscuit cookies depending on the size. They store great in an airtight container for several weeks. 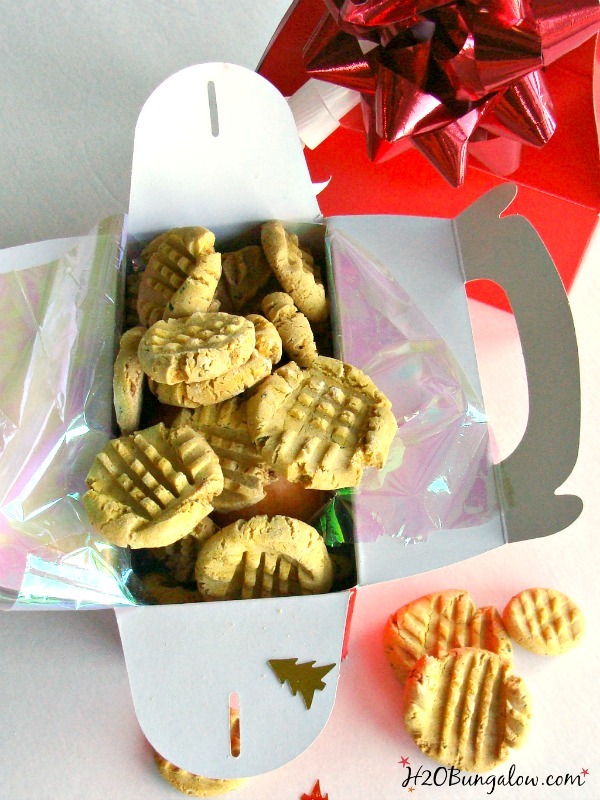 This gluten free dog treat recipe makes great stocking stuffers too! Need a healthy gift idea for the feline family member too? Try these Organic Catnip Toys! Everyone loves them! Can I omit the dried milk ? Hi Kris, You can definitely try! I haven’t tried the recipe without the milk so I can’t say for sure how well it will work. Good luck and thanks for your visit! Awe Wendi, I’m so sorry to hear about Cinnamon. So sad, especially so close to the holidays. 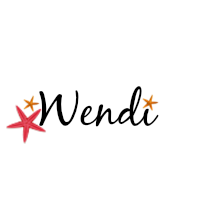 I will pin your dog biscuit recipe to my Pet board to share. My beloved Shanleigh, who had a very sensitive tummy, would have loved these biscuits. Wishing you and yours a Merry Christmas my friend! Thanks Marie, we miss her & thanks for sharing the recipe too! Merry Christmas! Aww, Wendi, I lost one of my dear four legged friends recently too. It can be hard when you lose your furry friends, but I know she was very much loved and that she knew it. The treats would be very nice for my other fellow, maybe I’ll give them a try. I wish you and yours a very Merry Christmas and I’m looking forward to a new year full of power tools and projects! I also want to thank you for all of your support throughout this, my first year. Ho MAry and yes, she knew she was loved. I’m sorry you lost a furry friend too:( Your pup will love these treats. One recipe makes a lot of them too! You are so welcome it’s been fun getting to know you this past year! Keep up the good blogging work! Hugs & Merry Christmas! Oh gosh, I have been talking about making dog biscuits all fall long. Thank you so much for posting this Wendi! (and I’m so sorry about your pooch, what a sweet face she had!) Many hugs to you my friend! Hi Janell and thank you. She was a sweetheart and we miss her. You’ll, or should I say your furball will love these treats! Enjoy & Merry Christmas!